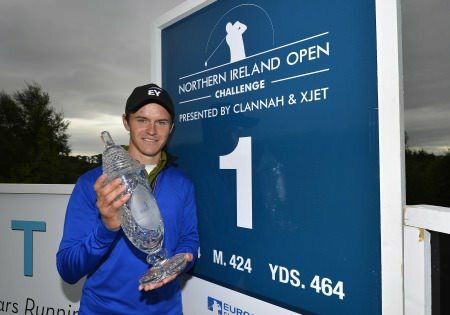 The home contingent had reasons to be cheerful but there was nobody happier than Sweden's Joakim Lagergren at Galgorm Castle as he claimed his maiden European Challenge Tour title at the Northern Ireland Open Challenge in association with Maui Jim Sunglasses. The 22-year old produced a grandstand finish, holing an eight foot clutch putt at the last for a birdie and a one-stroke victory having opened the door for the chasing pack with a wobbly start. Lagergren held a six shot lead heading into the final round at the packed Galgorm Castle, where crowds of over 34,000 flocked through the gates all week, but bogeys at two of the first three holes gave the field hope and Frenchman Adrian Bernadet grabbed a share of the lead as Lagergren reached the turn. A birdie for the Stockholm player at the tenth edged him one clear again but he suffered a rocky finish, with bogeys either side of a birdie at the 16th meaning he stepped onto the 18th tee tied for the lead and needing to make a gain to avoid a play-off and claim the win. John Ross Galbraith (AM) on the 1st during Round 4 of the Northern Ireland Open Challenge in Galgorm Golf Club on Saturday 31st August 2014. When his second shot found the second cut of rough at the right edge of the green, he had to do it the hard way but he did so with nerveless efficiency, chipping to eight feet before sinking the putt under the most intense pressure to roars of jubilation from the crowds that packed the grandstand and surrounded the green. “This means a lot to me,” said Lagergen, who signed for a one over par final round 72 for a 13 under total. “I’m so proud and I’m so happy. I got a little bit stressed, I have to say. After nine holes I was tied for the lead with Adrian and then I knew I had to really get going and play some good golf. “I played a little bit better on the back nine, not as good as I wanted to but obviously it was enough so I'm happy with that. “I got the information on the 18th fairway that I needed birdie but I was going for it in two anyway. I hit a three wood off the tee and then I had a three wood in and it was a great chip and a great putt." Lagergren, who moved from 117th to 35th in the Challenge Tour Rankings, played his opening two rounds with Ballymena amateur prospect Dermot McElroy. The Irish international would have hoped for better than a pair of weekend 74s that left him 60th on four over. But he gained another four rounds of experience before his expected return trip to the Q-School later this month. Lurgan's Gareth Shaw (70) and Clandeboye's Jonny Caldwell (71) headed the home challenge as they tied for 12th on six under, seven strokes behind the winner. Shaw moved up to 80th in the Challenge Tour rankings, which could help him avoid Stage One of Q-School (the while Caldwell, who was Rory McIlroy's foursomes partner in the Walker Cup seven years ago, picked up a handy €2,890 as he battles to make his way in the game. (See this piece by the European Challenge Tour's Neil Ahern on Caldwell and his career). The 30-year old has played just three events on the Europro Tour this year but made every cut to lie 37th in the money list. However, he is not among the initial 22 Irish entries for the First Stage of the European Tour Qualifying School which will be played at eight venues across Europe from September 9 to October 3. Dubliner Niall Kearney, exempt into Stage Two of Q-School thanks to his Challenge Tour ranking, closed with a 68 to take 38th place on one under and earn €1,037. Rathmore's Alan Dunbar carded an excellent 67 to finish on level par and boost his confidence before he heads to Q-School in Scotland. Waterville's Mark Murphy, who is also set to begin his Q-School journey at the Roxburghe on September 9, shot 71 to tie for 56th on three over with Irish Close champion John-Ross Galbraith. The Whitehead amateur closed with a one under 70 to win the trophy awarded to the leading amateur and will have gained in confidence as he prepares to consolidate his amateur career before testing the waters at Q-School in the future. 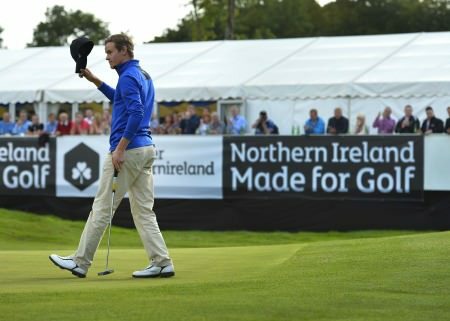 Jonny Caldwell leads the home challenge heading into the final round of the Northern Ireland Open Challenge in association with Maui Jim Sunglasses at Galgorm Castle.